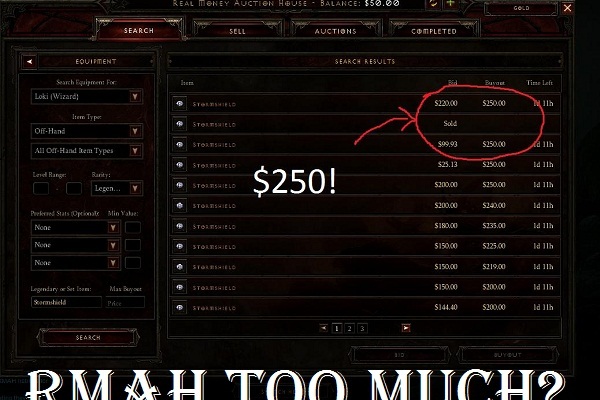 This has been long gone off the internet, but I wanted to keep it for posterity because it is a poignant run down of the failed design of Diablo 3 and its crippling interaction with the Real Money Auction House. The article is a great nostalgic read and a grim reminder of how far a license can fall when in the hands of the wrong company, the wrong developers and the wrong game designers. A lot of the problems this guy notes I never experienced, I wasn’t even able to get through act 1 before quitting. Things have changed for Diablo 3 from what I hear since the above was written, but my issues with the game had little to do with the RMAH in the first place, rather the core ARPG gameplay itself, which is not good and the core character models, which are silly looking and all run funny. I’ve always thought of doing a review, but Diablo 3 is one of those special games that is so bad it’s not worth reviewing. It gets the patented: unplayable/unreviewable rating a la the Onion. Next Next post: Gencon Tomorrow! Blood Rage tonight!